Decorative landscaping influences a diverse range of locations. When arriving at a housing development, a retail park, a school, or place of work. The quality of the surfacing as you approach creates an important impression and is an experience that takes in a combination of senses. The smoothness of the approach, be it in a vehicle or on foot, is felt before you enter the premises itself. Is it easy to travel over? A level and clearly defined route which is passable by pedestrians, bicycles, wheel chairs or cars is important on several levels from the practical to the aesthetic. Does the decorative landscaping work with the architecture? The colour scheme should be appealing to the eye whether it is intended as a subtle complement or an energetic contrast. NatraTex Cotswold and NatraTex Colour are coloured paving solutions which deliver a high quality finish combined with superb durability. Therefore, they have been used in such a broad range of residential, retail, education, and regeneration projects. 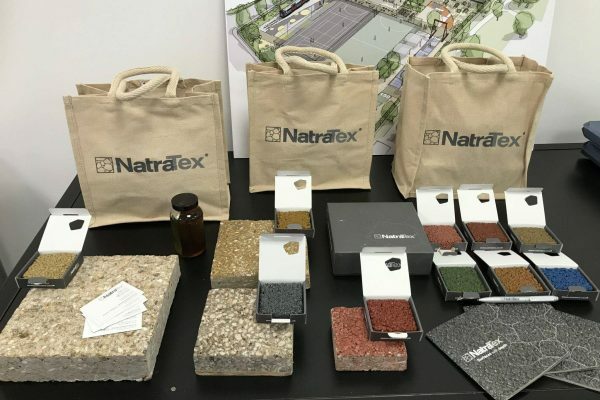 Our portfolio is packed with inspiring examples of how NatraTex has been used to create approach roads, driveways, car parks, pathways, playgrounds, foot paths and more. Utilising an innovative clear synthetic binder, this is a bound aggregate which allows the colour of the stone to show through, giving architects and landscapers an unrivalled palette to work with. Discover more about the technical details and qualities of the materials in our FAQ’s. Specifying NatraTex for decorative landscaping projects is easy with the help of our highly experienced and knowledgeable team. We can assist you to find the right coloured surfacing option to suit your outcomes. In delivering exactly what you require, hot and ready for working in insulated vehicles, NatraTex helps to keep your project on time and in budget. To discuss your project further and to get a quote, please contact us today.